We know you have a heart for giving, but with so many wonderful nonprofits in the area, staying up-to-date on the most pressing needs in our community can be a challenge. We want to make giving simple. That is why we have created GIVEdsm. 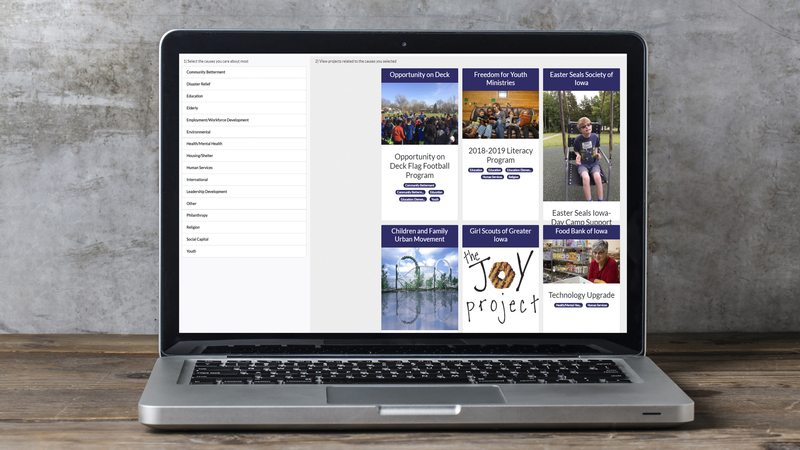 GIVEdsm is an online resource that provides the opportunity to learn about the needs of our community and offer support to those that match your interests. GIVEdsm provides an opportunity to be part of solutions by supporting the needs of nonprofit organizations. You can select your areas of interest and see profiles of available projects. Each profile provides the opportunity to learn more and then grant directly from your Community Foundation charitable giving fund or give directly to the organization. This is impact made easy. Interested in creating a profile? If you are a local nonprofit interested in completing a profile for GIVEdsm, let us know! You will simply complete a project form that asks the name of the project for which you are seeking support, a description of what you have planned, a photo, a funding goal and the date by which the money needs to be raised. Our team will use this information to create your interactive profile and help you make connections that count.